Disney’s Contemporary Resort is one of the two original resorts from Walt Disney World’s opening in 1971 (the second being Disney’s Polynesian Village Resort). In 2009, Disney completed construction on Bay Lake Towers, which features studios, one, and two-bedroom suites for the Disney Vacation Club. There are a few different room types available at the Contemporary Resort. You can chose a theme park view which affords spectacular views of the Magic Kingdom and Seven Seas Lagoon. There are also bay views of Bay Lake and garden views from the Garden Buildings. Disney’s Contemporary Resort is home to 2 heated pools, the main feature pool and a quiet pool, as well as 2 hot tubs, and a beach. The main feature pool is where you will find a 17 foot high curving waterslide. There are also poolside cabanas available for either hourly or daily rental at the feature pool. The cabanas have a TV, iPod docking station, mini fridge, and phone. There is a children’s splash area and kiddie pool, complete with fountains and waterspouts. Complimentary towels are available at the pools and hot tubs. From the beach at Disney’s Contemporary Resort, you can enjoy the nightly Electrical Water Pageant, a whimsical parade of lighted barges set to music. Be sure to check with the concierge desk for the time of the nightly performance. For the shoppers in your family, be sure to check out the fourth floor concourse, home to Fantasia, Fantasia Market, and Bay View Gifts. At Fantasia you will find pins, stuffed animals, games, and clothes. Fantasia Market carries snacks, newspapers, magazines, and essentials such as diapers, sunscreen, and shampoo. Finally, at Bay View Gifts you can grab items with the Contemporary logo, jewelry, home decor, character merchandise, and apparel. 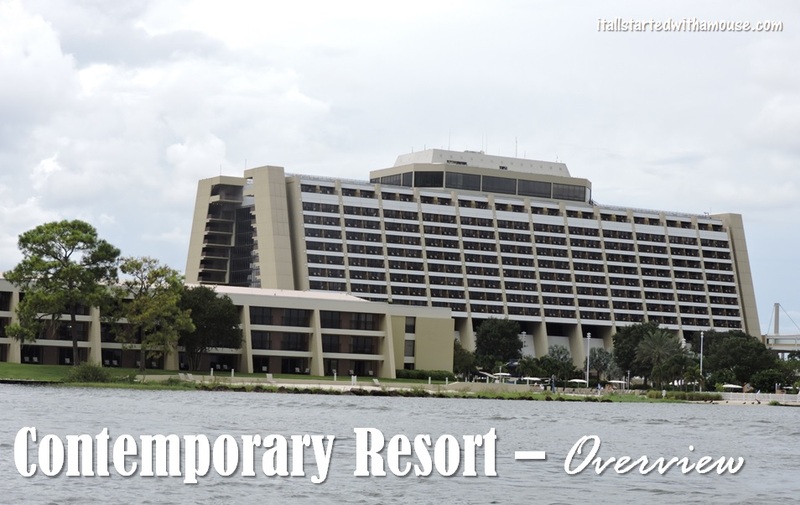 There are lots of dining options available at the Contemporary Resort. Whether you are in the mood for a romantic meal overlooking the Magic Kingdom, a quick bite to eat on the run, or meeting Mickey and friends, there is something for everyone. California Grill is a signature dining restaurant serving brunch and dinner located on the 15th floor. They have incredible views of the Magic Kingdom and a balcony where you can watch Wishes after your meal. Menu items include standard California fare such as sushi, seafood, steak, and veggies (full menu here). Chef Mickey’s is a character dining experience where you can meet the fab five and enjoy a buffet meal for breakfast, brunch, and dinner (check out the full menu here). The Wave … of American Flavors is a hidden gem located next to the concierge and check-in desks on the first floor. The Wave serves breakfast, lunch, and dinner with locally sourced ingredients and healthy dishes. (full menu here). Contempo Café is the Contemporary Resort’s quick-service location which is open for breakfast, lunch, and dinner. Menu options include pasta, flatbreads, salads, and sandwiches (full menu here). Standard rooms have either 2 queen beds or 1 king bed, and a daybed. Cribs are available upon request. Rooms come equipped with a safe, TV, mini-fridge, iron and ironing board, hairdryer, and free wi-fi. Amenities include: newspaper delivery, turndown service (upon request), voicemail, and valet parking ($20/day). 24 hour laundry facilities are located on the 2nd floor. There are also dry cleaning and valet laundry services available. Press “housekeeping” on your in-room phone to schedule a pick-up; services will be billed to your room.